Eastern Cottontails are the most common wild rabbit in North America. They are NOT closely related to our domestic pet rabbits. They have skills that allow them to survive in the wild, while a pet rabbit's skills have been bred out of them and bred to be dependant on human interaction. A person should NEVER release a pet bunny thinking it can survive - it can't and won't. It will become food for another wild animal or get killed in other ways. If you find an injured wild rabbit and can pick him/her up easily, then s/he probably needs help. A healthy rabbit will run from you if you attempt to pick her up. Google your state's fisheries and wildlife website to find a Wildlife Rehabilitator. What do you do if you find a baby wild rabbit? Click here and find out. Before clicking on this link, read MYTHS AND TRUTHS below. 1. If you find a nest of wild babies, covered with a "lid" of grasses, in the middle of an open field or your yard, their mom has abandoned them and they need to be rescued. FALSE: They have NOT been abandoned. The mother only visits them twice a day - at dawn and dusk, so as not to draw the attention of predators to the babies. Leave the nest alone and keep your dogs, cats and children away from it for three to four weeks. They will then leave the nest and be gone. 2. Mother rabbits are stupid because they made their nest in the middle of my yard. FALSE: They hide their babies "in plain sight" to lessen the chance that a predator will find them. 3. If you find an infant bunny outside of a nest, you can leave it out and the mother will look for it and bring it back to the nest. FALSE: Mother rabbits do NOT pick up and move their babies. Rabbit skin is very thin and can easily be ripped off of them. If an infant bunny is found outside the nest, the mother thinks of it as a write off. 4. If you handle a baby rabbit, then the mother will reject the baby because of the "human smell." FALSE: The mother's want their babies to live. The maternal instinct is strong. If mothers rejected their children because of their smell, we'd all be dead now. 5. If you move a rabbit's nest, the mother will search for it until she finds it. FALSE: If you move the nest any more than one foot or so, they mother will NOT look for it. She will think a predator got them and give up looking for them. 6. Both mother and father cottontails take care of the babies. FALSE: Only the mother takes care of the babies. The father has moved on and has nothing to do with them. 7. After the babies leave the nest, they are "trained" by their mothers. FALSE: Once the babies have left the nest, they are on their own. Mom is off making more babies. 8. 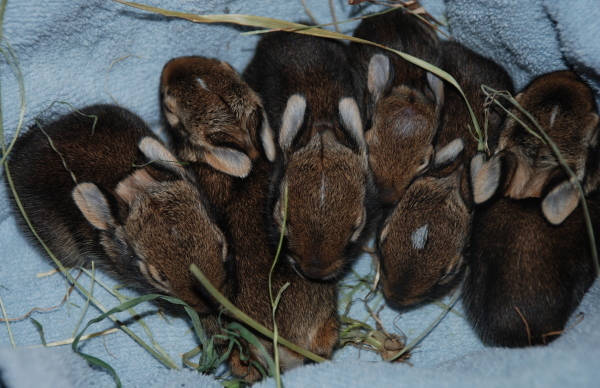 Eastern cottontails live in extensive tunnels underground. FALSE: Sometimes they will dig shallow holes in the dirt to cool off, or for a nest, but they do not go underground. It is our domestic rabbits, who are descended from the european rabbit (Oryctolagus cuniculus) that burrow underground and form warrens where their "tribes" live, sometimes as many as 30 in a tribe. 9. Cottontails live in family units. FALSE: Adult cottontails live a solitary life on the edge of woods, in meadows or orchards. They are territorial and do not tolerate the company of other cottontails, and will act aggressively towards each other.